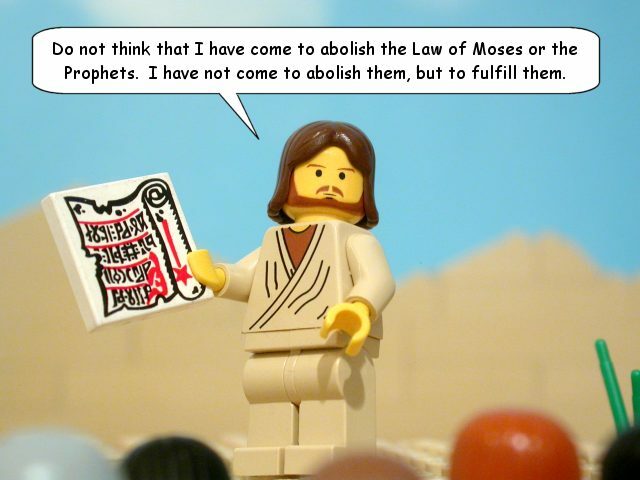 Let’s consider another verse: “Do not think that I have come to abolish the Law or the Prophets; I have not come to abolish them but to fulfill them” (Matt. 5:17). Here we see that law’s significance doesn’t lie in the plain meaning of the commands. If we are only to read and obey the law, there is no need for Jesus to fulfill it. But if the law can only be fulfilled by Him we can’t fulfill it even if we keep every command. Jesus communicated this to the rich young ruler. He had kept all the commandments but still lacked one thing—Jesus Himself (Mark 10:17-21). These verses also make it clear we can’t disregard God’s commands. Nowhere in the New Testament will we find permission to covet, commit adultery, or to break any other law. But here we get into difficulties. While the disciples continued to honor marriage, discourage theft, and condemn idolatry, they didn’t continue the sacrifices, feasts, or temple worship. At first glance it seems that they—and we—have broken the law and violated Jesus’s teachings about it. We will explore this apparent contradiction but first we need to examine how Jesus fulfilled the law. The Old Covenant could be kept in essentially two ways. The first was not to break any commandments. However, no one has ever done this. If God was to be in covenant with anyone at all, He had to provide an alternative. This is where the sacrifices came in. For sins whose penalty was death, the offender could offer an animal in his place (Lev. 4:35). Other sins carried different costs—sometimes monetary, sometimes in replacing damaged items. The law’s basic formula was, “Life for life, eye for eye, tooth for tooth, hand for hand, foot for foot” (Deut. 19:21). Jesus fulfilled the law in both aspects. While on earth, He never sinned (Heb. 4:15). On the cross He offered Himself “as an atoning sacrifice for our sins” (1 John 4:10). Jesus’s sacrifice also demonstrated divine love and fulfilled the heart of the law: “Love does no harm to its neighbor. Therefore love is the fulfillment of the law” (Rom. 13:10). There is another way Jesus fulfilled the law, perhaps more comprehensive than what we have said so far. Jesus was not “plan B” in case the law failed. Jesus was always the plan (Acts 2:23; 1 Peter 1:20, 21). The law was “plan B” to Him, a way for God to be in relationship with people until Christ’s coming (Gal. 3:23-25). The law foreshadowed Christ and was never the end all (Col. 2:16, 17; Heb. 10:1). Its purpose was to testify of the only means of righteousness—Jesus (Heb. 2:3). Jesus fulfilled the law because He was the reality of it. God had Him alone in mind when He wrote it with His own finger on tablets of stone and delivered it to Moses (Exodus 31:18). All of this is well and good for Jesus. But it doesn’t help unless His fulfillment of the law translates into our relationship with God. Yet this is where we find ourselves in difficulties—Jesus fulfilled the law, yet we aren’t free to break the law, yet there are parts we observe and parts we don’t, yet God commanded all of it, yet…on and on. It is also at this point that critics raise objections to our faith and where sects insinuate distortions of truth. By such distortions, many believers are enslaved by legalism (Gal. 5:1). How can we reconcile these things? To answer this, we need to divide the law of Moses into two broad categories: 1) Ceremonial/ritual law. This category includes sacrifices, feasts, dietary laws, temple designs, priestly garments, etc. ; 2) Moral law or commandments concerning behavior: You shall not steal, you shall not move a boundary stone, honor father and mother, and many others. More subcategories could be introduced but we can fairly fit any law under these headings. These two categories correspond to two aspects of our relationship with God in Christ: 1) Us in Christ; 2) Christ is us. Simply put, all ceremonial/ritual law is fulfilled as we live in Christ, and all moral law is fulfilled by Christ as He lives in us. You raise some interesting questions. (Interesting because I have them too. Psalm 119 and affection for the wonderfulness of the law raises even more.) I await the next installment. Really enjoying your blog. I am surprised how common it is for believers to teach that the ceremonial laws are fulfilled, but the moral laws are unfulfilled. I am with you in declaring every jot and title fulfilled in Christ. (“if the ministration of death, written and engraven IN STONES, was glorious” ) 2 Cor. 3:7, is specifically referring to the moral laws. Then he says “that the children of Israel could not stedfastly look to the end of that which IS abolished” vs.13. This end was His death and our death in Him.